Here are some reviews of Jilda’s Ark: thanks to these reviewers for generously taking the time to write them! Jilda didn’t know just how much her Sweet 16th birthday would surprise her. In Verity Croker’s book “Jilda’s Ark”, her story takes us through a journey of more than just a girl’s realization that being taking away mistakenly isn’t as bad as what she learns as to the reasons why and also she learns a little more about her own sexuality. The story begins with a typical teenager’s desire to spend their Sweet 16th on a cruise. Jilda and her twin sister Rosa had taking this journey with their mother. However, Jilda falls ill one day and stays behind to rest. To the horror of any alone teenager she wakes to discover the ship has set off leaving her mother and sister behind. Only a few remain and are now under orders from people that have now taken over the ship. It’s hard to say without going into too much detail what a profound impression that this books can leave on a reader. Although, the places and people are fiction just knowing that real life events such as these happen will leave an everlasting impression. Increasingly many Australians are cruising the oceans of the world. Nevertheless I was surprised to read a novel set on a cruise ship. I doubted that could be interesting. 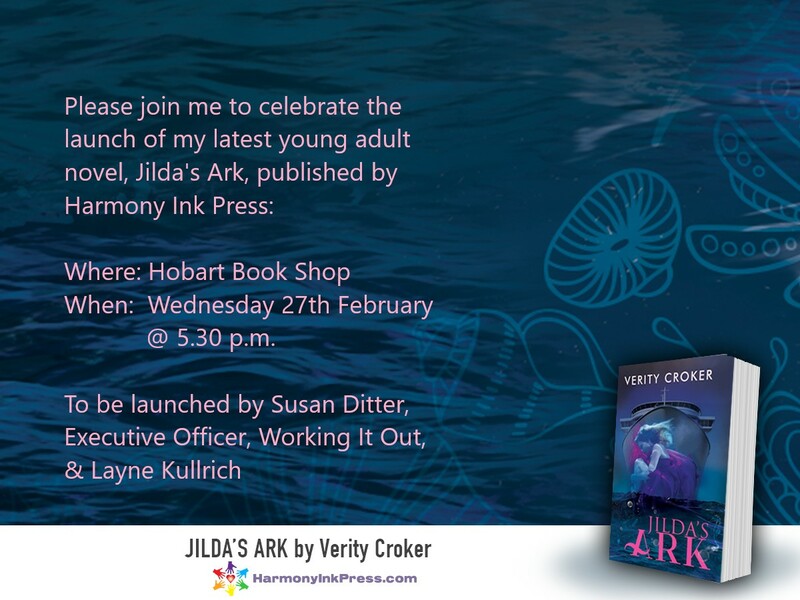 To my happy surprise Verity Croker’s new novel Jilda’s Ark was a great read from the beginning. I was immediately hooked and read into the early hours of the morning. Then, sharp awake at 4.30 am, I felt compelled to pick up the book and read more of Jilda’s story. I love stories where I cannot predict what will happen and when they become exciting page turners. Jilda’s Ark offered both these treats. The author has crafted the story well by using the dynamic voice of the heroine Jilda as the narrator. Verity does not tell us that Jilda might be thinking rather we ‘hear’ Jilda thinking and ‘see’ her doing. The result is a book brimming with energy. Jilda’s story meshes with currently topical themes including environmentalism, animal welfare, communities working together and gender issues. Thank you so much to Chris Pearce and his staff at the Hobart Book Store for hosting my launch of Jilda’s Ark. They are so helpful and welcoming. Thanks also to everyone who came and helped me celebrate! A special thanks to Susan Ditter, Executive Officer of Working It Out, and Layne Kullrich, who both so generously donated their time to read the novel and prepare their thoughtful speeches which they delivered at the launch. All very much appreciated!